Approximate extent of East Iranian languages in the first century BC is shown in orange. The Sarmatians, Sarmatae or Sauromatae (Old Iranian Sarumatah "archer") were a people originally of Iranian stock. Mentioned by classical authors, they migrated from Central Asia to the Ural Mountains around 5th century B.C. and eventually settled in most of southern European Russia, Ukraine, and the eastern Balkans. Pliny the Elder (N.H. book iv) wrote that the Latin Sarmatae is identical to the Greek Sauromatae. At their greatest reported extent these tribes ranged from the Vistula river to the mouth of the Danube and eastward to the Volga, and from the mysterious domain of the Hyperboreans in the north, southward to the shores of the Black and Caspian seas, including the region between them as far as the Caucasus mountains. The richest tombs and the most significant finds of Sarmatian artifacts have been recorded in the Krasnodar Krai of Russia. It is perhaps no coincidence that the boundary between the so-called Centum-Satem isogloss in the Indo-European languages apparently split at the European border of the Sarmatians. Around the year 100 BC, Sarmatian land ranged from Barents Sea or Baltic Sea ("Oceanus Sarmaticus") to tributary of Vistula River, to the Carpathian Mountains, to the mouth of the Danube, then eastward along the northern coast of the Black Sea, across the Caucasus to the Caspian Sea and north along the Volga up to the polar circle. The Sarmatians flourished from the time of Herodotus and allied partly with the Huns when they arrived in the 4th century AD. 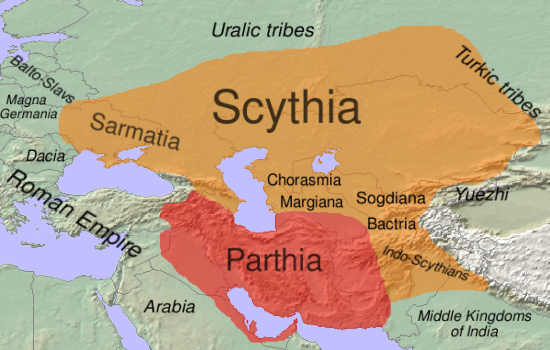 The Sarmatians were closely related to the Scythians. "They [Sarmatian women] have no right breasts...for while they are yet babies their mothers make red-hot a bronze instrument constructed for this very purpose and apply it to the right breast and cauterize it, so that its growth is arrested, and all its strength and bulk are diverted to the right shoulder and right arm." The most fascinating feasture of Sarmatian culture is their women warriors. Herodotus reported that the Sarmatians were said to be the offsprings of Scythians who had mated with Amazons and that their female descendants "have continued from that day to the present to observe their ancient [Amazon] customs, frequently hunting on horseback with their husbands; in war taking the field; and wearing the very same dress as the men" Moreover, said Herodotus, "No girl shall wed till she has killed a man in battle." Both Herodotus and Hippocrates accounts inform us the Sarmatians took interest in turning their women into strong-armed huntresses and fighters. Archaeological materials seem to confirm Sarmatian women''s active role in military operation and social life. Burial of armed Sarmatian women comprise large percent of the military burial in the group occupy the central position and appear the be the richest. 2. Prehistoric Art. Nomads of the Sarmatians and Huns Time. 3. Apollonius (Argonautica) envisaged the Sauromatai as the bitter foe of King Aietes of Colchis (modern Georgia). 4. Handbuch der Orientalistik, Iranistik. By I. Gershevitch, O. Hansen, B. Spuler, M.J. Dresden, Prof M Boyce, M. Boyce Summary. E.J. Brill. 1968.